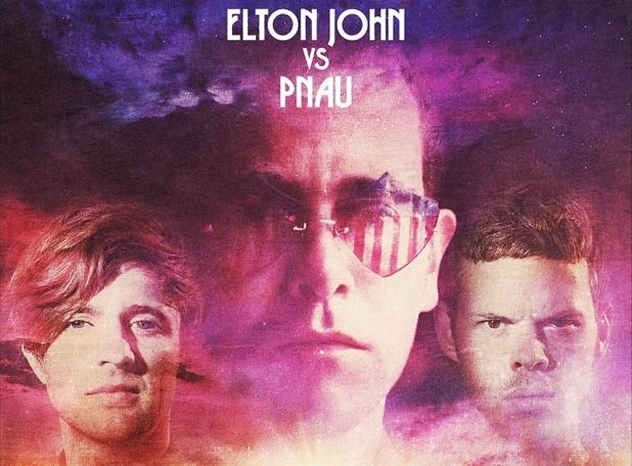 Apparently 5 years ago, Elton got Pnau’s album and fell in love with their music. That resulted dragging them to UK to work on collaboration, and who would ever say no to Elton?? John gave them full freedom to go trough his work and change it in any way they want, that’s a huge trust, but I definetly think it paid off big time, because amazing songs were born! One of modern music’s most influential artists and Australia’s leading electronic duo, liberates decades of archived recordings and compositions in lesson of creation, enlightenment and rebirth. Sir Elton Hercules John, (born Reginald Kenneth Dwight on 25 March 1947) is an English rock singer-songwriter, composer, pianist and occasional actor. John was the eldest child of Stanley and only child of Sheila Eileen Dwight. When John began to seriously consider a career in music, his father, who served as a Flight Lieutenant in the Royal Air Force, tried to steer him toward a more conventional career, such as banking. John has stated that his wild stage costumes and performances were his way of letting go after such a restrictive childhood. John started playing the piano at the age of 3. At the age of 15, with the help of his mother and stepfather, he became a weekend pianist at a nearby pub, the Northwood Hills Hotel, playing Thursday to Sunday nights for £35 a week and tips. In 1964, John and his friends formed a band called Bluesology. By day, he ran errands for a music publishing company; he divided his nights between solo gigs at a London hotel bar and working with Bluesology. After failing lead vocalist auditions for King Crimson and Gentle Giant, John answered an advertisement in the New Musical Express placed by Ray Williams, then the A&R manager for Liberty Records. At their first meeting, Williams gave John a stack of lyrics written by Bernie Taupin, who had answered the same ad. John wrote music for the lyrics, and then mailed it to Taupin, beginning a partnership that still continues, resulting collaboration on more than 30 albums up to date. When the two first met in 1967 they recorded what would become the first Elton John/Bernie Taupin song: “Scarecrow”. Six months later, then Reginald Dwight, was going by the name “Elton John” in homage to Bluesology saxophonist Elton Dean and Long John Baldry. But non of that stopped him from becoming a legend and in his four-decade career John has sold more than 250 million records, making him one of the most successful artists of all time. His single “Candle in the Wind 1997” has sold over 33 million copies worldwide, and is the best selling single in the history of the UK Singles Chart and the US Billboard Hot 100. He has more than 50 Top 40 hits, including seven consecutive No. 1 US albums, 56 Top 40 singles, 16 Top 10, four No. 2 hits, and nine No. 1 hits. He has won six Grammy Awards, four Brit Awards, an Academy Award, a Golden Globe Award and a Tony Award. In 2004, Rolling Stone ranked him Number 49 on its list of the 100 greatest artists of all time. John was inducted into the Rock and Roll Hall of Fame in 1994. Having been named a Commander of the Order of the British Empire in 1996, John received aknighthood from Queen Elizabeth II for “services to music and charitable services” in 1998. John has performed at a number of royal events, such as the funeral of Princess Diana at Westminster Abbey in 1997, and the Queen’s Diamond Jubilee Concert outside Buckingham Palace in 2012. He has been heavily involved in the fight against AIDS since the late 1980’s. In 1992, he established the Elton John AIDS Foundation and a year later began hosting the annual Academy Award Party, which has since become one of the highest-profile Oscar parties in the Hollywood film industry. Since its inception, the foundation has raised over $200 million. John entered into a civil partnership with David Furnish on 21 December 2005 and continues to be a champion for LGBT social movements. In 2008, Billboard magazine ranked him as the most successful male solo artist on “The Billboard Hot 100 Top All-Time Artists” (third overall, behind only The Beatles and Madonna). It was announced in March 2012 that Elton had recently completed work on his thirty-first album entitled The Diving Board. The album’s release will be around March 2013. Till then you can enjoy an album containing remixes of songs that John recorded in the 1970s called “Good Morning To The Night“ . It was released in July 2012 and the remixes were conducted by Australian group Pnau. Pnau is an Australian dance music duo originating from Sydney, Australia. The duo consists of musicians Nick Littlemore (vocals, production) and Peter Mayes (guitar, production). In 1999, Pnau officially released their debut album Sambanova under the independent label Peking Duck. It was recorded in a bedroom studio and they only expected to sell a few thousand copies.The album turned out to be a surprise success when it won Best Dance Release at the ARIA Music Awards. A week later, however, the album was pulled from record stores for using uncleared samples. Pnau released their second album, Again in 2003, but because of Again’s lackluster success the pair parted ways for some time to work with other artists such as Robbie Williams, Van She, and Lost Valentinos. When the two reunited in 2007 they wrote over two-hundred songs together and started to lay down an entire album. The album not only featured vocal work from Luke Steele and Nick Littlemore himself, but also had many guest appearances such as Ladyhawke, Nik Yannika from Lost Valentinos and Michael DeFrancesco from Van She. The album was released to high critical acclaim and gained unexpected favorable attention from Elton John, declaring it to be the greatest record he’d heard in ten years. In 2011 Pnau released their fourth studio album Soft Universe. Littlemore has described it as a very “emotional” album, inspired by the break up with his long-time girlfriend. With input from Elton John, the album features Littlemore singing all the vocals on the album along with tracks co-written with fellow Aussie artist Martin Craft and producer Mark Saunders. On the 2nd of June, the collaborative album with Elton John “Good Morning to the Night” was released. The pair have achieved multiple successes throughout their career with their award-winning debut album Sambanova, their breakthrough side-project Empire of the Sun, and their multiple chart-topping singles. When it comes to the name, one accepted pronunciation of Pnau is “pah-now”. The name is commonly accented to simulate the sound of a gunshot. Nick Littlemore explained the name was the result of an instance when he was speaking in tongues. After shouting gibberish for half an hour, Littlemore decided Pnau would be an appropriate band name. Another theory on the pronunciation, according to one interview with the pair, is “pah-nyeow”. The group has on other occasions explained that the name “rhymes with meow”.